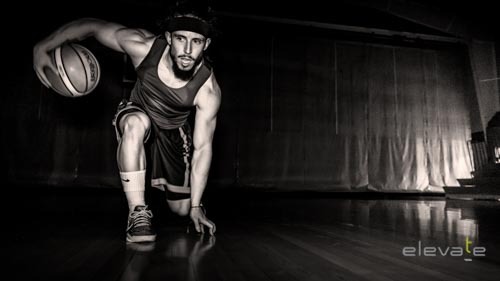 Following treatment for testicular cancer at age 24, Eric Benedick pulled himself from a pit of despair and decided not only that he wanted to get back to living, but that he didn’t want to give up on his dream of becoming a professional basketball player. In 2015, he realized that dream by being invited to play part of a season on a team in Iceland. As part of his athletic rehabilitation, he came to Elevate, working hour by hour to bring his body back to a high level of performance. He credits the support of Elevate coaches for believing in, helping him find the “drive and hunger” to continue to train, showing him patience until he fell in love with the process, and inspiring him to work to become be the best athlete he could be. Eric, an Albuquerque native, is a current professional basketball player under the FIBA basketball umbrella in Europe. This past 2015/2016 season he competed for club “UMF Sindri” in the Icelandic Basketball Association (KKI). Eric attributes his very successful season averaging 32.8 points, 7.1 rebounds, and 6.3 assists per game in large part to the preparation he received at Elevate PHW. Prior to becoming a professional, he competed at the collegiate level for both Northern New Mexico College (NAIA) and Tohono O’odham Community College (NJCAA). He is currently training hard daily in preparation for the upcoming 2017 season. Eric Benedick Photo: Mike Radigan.